Softens lines and unifies the skin. 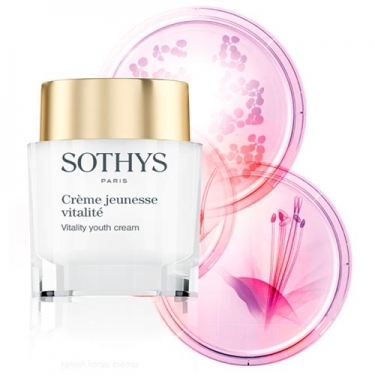 DESCRIPTION: Crème Jeunesse Vitalité from Sothys is a cream to attenuate the signs of fatigue, to smooth the traces and to uniform the complexion. The skin is resplendent with freshness, the youth preserved. 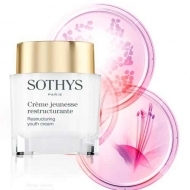 Active Ingredients: A pore refiner system that acts on the causes of age-related pores (loss of elasticity) and visible signs (collapsed pores), (polyphenols from the mature fruit of Rosa multiflora thunberg); Chrono-energizing complex (salts of Mg, Cu, Zn, Ca) that remineralize the skin; Phytic acid to cool the skin gently; BP3. 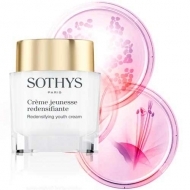 Tri-Complex Safran-Sophora-Peptides that allow the skin to fight against oxidative stress and fight the signs of chronological aging.